Really missing my Gathering Georgetown students today, so I thought I’d share some of my favorite moments from this past school year! Before I entered full-time ministry, it truly was not a struggle to spend time with the Lord daily. That sounds crazy, I know, but it’s true. Even when I was working crazy hours on Capitol Hill and volunteering part-time with The Gathering, I still reached for my Bible and gave it my full attention at least once a day. I rarely missed a day. But this season has been different. Full-time vocational ministry is full of daily struggles and victories and is more spiritually challenging than anything I have experienced before. This dichotomy pushes me to spend time in the Word every day and to be more like Christ, so that I can be a more effective minister of the Gospel. However, I often struggle to balance investing in others while also investing in myself and my own spiritual life. I also struggle to delegate and equip others rather than just doing everything myself and in my own power. Now, all too often, I am distracted by yet another need or task and have to remind myself frequently that I need to put my time with the Lord before everything else. He must be my first priority! My two years in vocational ministry have taught me that ministry absolutely must be driven by the overflow of Christ in my heart. If ministry is driven by my will, rather than by my love for Him, it is meaningless. Likewise, I have also learned that my passion for ministry must be exceeded by my passion for Christ Himself. Jesus is not only my motivation; He is my treasure. Just as the man who found the treasure hidden in a field in Matthew 13 and sold everything he had to buy the field, I want to live my life in passionate pursuit of Christ, regardless of the cost. While these verses reference the kingdom of God, the Lord has used them recently to show me much about my own heart. It is so easy to think that just because I’m pouring out my life in ministry, that Christ Himself is my treasure. When you sacrifice much for ministry, it’s easy to point to your clear prioritization of people as prioritization of the Lord Himself. Unfortunately, I’ve found that in the midst of rushing around to accomplish things and do ministry, it is simple to begin to treasure the ministry above Christ. I’m thankful for the discipline of the Lord. I’m so grateful that He is willing to pursue and recapture my heart and redirect my attention back to Himself. I’m thankful that He is a jealous God and that He will not allow my heart to be satisfied outside of Himself. Don’t allow ministry, even great ministry, to replace Christ’s position in your heart. He, and He alone, is your treasure. Cherish your people. Treasure your God. Don’t allow the lines to be blurred. It’s always good to start your Monday morning with a good, gospel-centered article on why and how you should face another potentially grueling week of ministry. This article was really encouraging to me this morning and I hope it will encourage you as well! If you are interested in reading further on counseling or need counseling resources, I highly recommend that you check out The Biblical Counseling Coalition’s blog. Another great counseling resource is Biblical Counseling for Women. When you’re exhausted, what motivates and empowers you for ministry? How do you begin your week? Leave a comment – I’d love to hear from you! 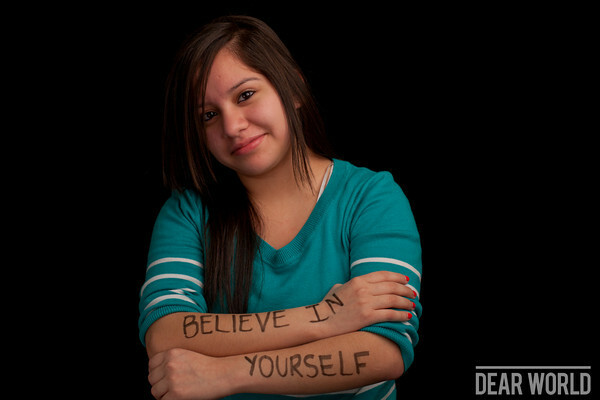 If you are not familiar with this project, essentially it promotes freedom of speech and allows students to be photographed with whatever they want written on their arms, legs, hands, faces, etc. As I looked through this album this week while I was stuck at home because I was sick, I was moved to pray. Most students’ messages are humanistic (“I can, through my own strength”), while others focus on love (“love conquers all, love one another”). My heart for them is that they will come to know their all-powerful Creator, and live through His strength and love. I just wanted to share this with you all do that you can pray with me – that the Gospel will illuminate the hearts of Georgetown’s students and that Christ will be exalted on the Hilltop. This past week has been one of the best weeks I’ve had with the Lord in a long while. You know how sometimes you are so stuck in yourself and your situation that you can’t see clearly where the Lord is taking you? All too often that is the state of my heart. I allow my heart to get caught up in all of the “what ifs” and “I can’ts.” Maybe it’s just me that’s this hardhearted, forgetful, and stubborn, but I’m so thankful that the Lord is willing to continue to speak to my heart and reinforce His message everywhere I turn. After going through a season of confusion and doubt, I can often see proof that the Lord’s been working on my heart for a long while but I haven’t had ears to hear or eyes to see what the Lord has been working to reveal. I often identify with Jesus’ apostle Peter. This is the guy who Jesus referred to as “a rock” in Matthew 16:18, but who though he was willing to get out of a boat and walk on water to Jesus, eventually faltered as he took his eyes off of Jesus to look at the situation surrounding him. The cool part of these stories to me is that Jesus didn’t call Peter a rock and say He would use him to build His Church BEFORE He saw all of Peter’s weaknesses in Matthew 14. No, Jesus’ statement about Peter came in Matthew 16, even after he faltered on the water. Jesus knows our weaknesses. He knows my heart’s tendency to wander. He knows my tendency to take my eyes off of Him. He knows of my desire to stay safe and dry in the boat. And He still wants to use me. I had a startling revelation on Monday. I was watching C.J. Mahaney’s T4G2012 talk “The Sustaining Power of The Gospel,” and the Lord made so many different things click into place in my heart. I realized that all of the confusion I’ve been feeling lately is a direct result of unbelief that has taken up residence in my heart. Like the Israelites of old, I’ve made myself comfortable with where I am and I’ve become unwilling to venture out, even in response to God’s call. I’ve forgotten the perfection of God’s provision. I’ve convinced myself that suffering isn’t inevitable and that security lies exactly where I am right now. I’ve let fear of the future and the failures of the past convince me that God isn’t faithful. Me, the girl whose favorite attribute of God is His faithfulness. I took my eyes off of Him and didn’t even want to venture out. I desired comfort more than I desired Christ. It’s not supposed to be easy. Life isn’t easy, just as marriage isn’t easy (see Marriage is Nothing Like a Hallmark Card). We’re not called to the American dream. And God made it this way on purpose. Despite my desire to be safe, secure, and comfortable, God is calling me to suffer. And what makes it all worthwhile is that “these realities have a divine design. They are purposeful. Each of these times of hardship is an opportunity to show His power… when [others] watch you in suffering, they want to see if the Gospel makes a difference.” He is developing our character, building our witness, and bringing Himself glory. Take heart today! Be willing to step out in faith to follow God’s calling on your life. Our current (or future) suffering, when compared with future glory, is completely worth whatever hardships may come our way. The Apostle Paul even goes so far as to say that there is no comparison with the eternal glory that will come as our reward! It’s been more than two months since I last posted an entry. Two. Months. That’s a long time, even for me. I meant to write, I really did. I’ve learned so much…. SO. MUCH. I had no idea how much more true that statement could become. I thought I had changed through the process of dreaming and aspiring to ministry. And then I jumped into ministry and realized that relative to where my heart needed to be, I hadn’t changed much at all. I’ve realized that Miller is really, truly, and absolutely correct. Each phase, each part of the road, so to speak, involves some changing, some growing, and some adjusting. But sometimes there are major changes, seismic shifts, if you will, that God desires to create in the very depths of who we are, and those kinds of changes are the ones that turn us inside out, let us see who we really are, and then gracefully push and mold us into the people that God created us to be. Now that I’m in ministry, I see in a new way how very much I need the Gospel. I’ve seen in one short month just how much of a jerk and a coward (to use Miller’s language) that I am. It’s true. I’m praying the words of John 3:30 “He must increase, but I must decrease,” more than I ever have in my life! Everyone who has ever told me that ministry is hard told the truth. There are competing visions, clashing cultures, and multiple ways of getting a job done. Being in ministry has made me feel more inadequate than any job in government ever could have. I see all of my flaws under a microscope now – I’m impatient, prideful, easily frustrated, and stubborn. I have to cling to the Gospel, trusting that the Lord knows what He’s doing, why He’s chosen to use me to do it, and how He’s going to break me to the point that I’m usable. I had no idea the growth, maturity, and transformation that the last month would bring, but I was right… these things, while difficult while the battle rages, are what makes every moment of the journey worthwhile.